In 2014, Iraqi author Ahmed Saadawi won the International Prize for Arabic Fiction, commonly known as the Arabic Booker Prize, for Frankenstein in Baghdad. Four years later, the English translation has become available and it reveals a novel worthy of an award. 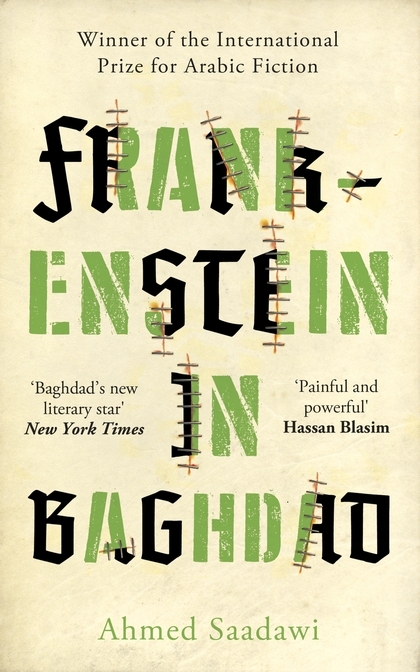 Frankenstein in Baghdad takes Mary Shelley’s familiar horror trope and transplants it to the streets of Baghdad not long after the American invasion and the fall of Saddam in 2003. In doing so, it manages not only to illuminate that period but to create a new, compelling version of a longstanding myth. No one saw it coming; it all happened in a fraction of a second. The people who weren’t injured – because they were too far away, or screened by other people’s bodies or behind parked cars, or because they were coming down the side lanes and hadn’t reached the main street when the explosion went off… witnessed the explosion as it engulfed the vehicles and the bodies of the people around them. It cut the electricity and killed birds. Windows were shattered and doors blown in. Cracks appeared in the walls of nearby houses, and some old ceilings collapsed. In the confusion, junk dealer Hadi finds a nose, which he takes home and uses to finish off a body that he has created by sewing together body parts of the dead. Not long after this, another vehicle bomb kills Hasib, a hotel security guard. Freed from his body, Hasib’s soul enters the composite body and animates it. The body heads next door where Elishva, an old woman who everyone thinks is crazy, mistakes him for her long-lost son Daniel. She takes him in, telling him the story of the man who sent Daniel to his death 20 years before. The next day that man — and others — are dead, and it seems that the creature called Daniel is responsible. While there are definite supernatural elements in this book (The Whatsisname, as the creature is called, is hunted by an X-Files-style unit called the Tracking and Pursuit Department, which relies on astrologers and soothsayers), Saadawi is interested in using the story to shine a light on life in Baghdad at the start of the American occupation. The narrative ranges across a large number of characters – including the old woman Elishva and her neighbours: Abu Annam, the owner of a local hotel; Faraj, an unscrupulous real-estate agent; and journalist Mahmoud al-Sawadi, who works for a local magazine and finds himself following the story. Bombings are constant; militias, police and the US military roam the streets engaging in gunfights. Yet ordinary people still gather at Aziz’s coffee shop to discuss the news and gossip. Many of the characters are looking for a way out, planning to leave, while others see the opportunity in the chaos around them. But once vengeance has been achieved, the associated body part falls away. So in order to remain alive, the monster must keep replenishing himself. He gathers a group of fanatical followers who source new body parts for him, but the line between innocent and criminal becomes blurred to the extent that those followers become unsure about what it is that they are trying to achieve. The debate among his followers over who the monster should be killing becomes a struggle between their two leaders known, to avoid any ambiguity, as the Magician and the Sophist. The debate considers what it means for his mission if his replacement body parts come from criminals. And what justifications can he use to kill the innocent to keep himself alive? Frankenstein in Baghdad works on a number of levels. As a dark satire on the madness of war, as a slice of life (although with a magical element) of Baghdad in the early years after the Americans came in 2003, or as a horror story with an implacable, tortured monster at its centre. That this mash-up works so completely is a credit to Saawadi.